High-volume padding makes the Pad About a great choice for your padding needs. The Pad About is capable of padding over 10,000 sheets of paper at a time. Once paper is in place, it is clamped down and glue is added to the spine of the paper. Once the glue has dried, the pad can be removed and cut into smaller pads. A convenient rotating table eliminates the need to lift paper stacks. A stand, placed on casters, lets you move the padding press to any location. This versatile unit maximizes shop scape and pad productions. The Pad About pads up to 10,000 11" wide sheets. Convenient rotating table eliminates the need to lift paper stacks. 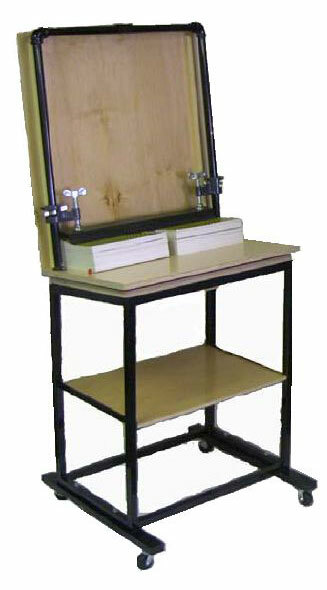 Stand allows for moving padding unit to where job is or moving out of the way when not in use. Constructed of 3/4" select white maple with welded steel frame and quality casters.